The movie CODE exposes the dearth of female and minority software engineers and explores the reasons for this gender gap and digital divide. The film highlights breakthrough efforts that are producing more diverse programmers and shows how this critical gap can be closed. Pam Torres, SVP at Bank of America, joins Terry Cox in providing a few opening remarks. 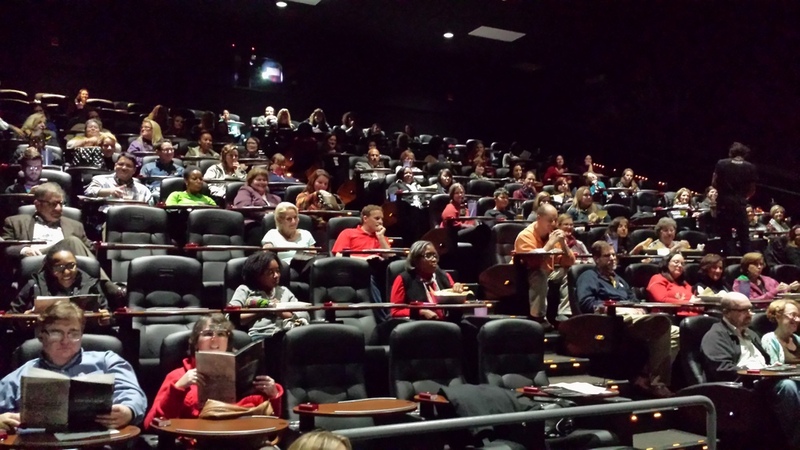 Bank of America had a strong showing at the Epicenter, site of the movie screening, with over 70 employees in attendance. Pam Torres, SVP and Senior Business Executive of Technology, gave brief comments prior to the showing. Special thanks to Paula Paul, who originated the idea of showing the movie, and worked hard to get it to Charlotte. Thank you Paula! Attendees gather for the movie at the Epicenter. Charlotte Hearts Gigabit is on the City of Charlotte Digital Inclusion Steering Committee. We believe that the benefits of being a Gigabit city are minimized where segments of society are under-represented. We need more women and minorities in computer science, filling the job opportunities coming about in the connected digital world. Please join us in supporting this effort. Subscribe to our newsletter, follow us on Twitter, and email us (info@charlotteheartsgigabit.com) on how you'd like to work with us.